On Thursday begins with the first leg of the round of the last 32 in the Europa League. The duel between Belgian and Austrian champions will take place at Jan Breydelstadion: Club Bruges will host Red Bull Salzburg. Brugge have to continue after third place in the Champions League Group A behind Borussia Dortmund and Atletico Madrid in the Europa League. In the Belgian Jupiler League it seems for the blue-black this season probably only to runner-up title to submit. League leader Genk has eleven points advantage. Red Bull Salzburg once again proved to be a specialist in the group stage in the Europa League, winning all of their six games, leaving Celtic, RB Leipzig and Rosenborg behind. In the Austrian Bundesliga, the Bulls are still undefeated after 18 match days and with a lead of 14 points on the first pursuer Linz clear again on master class. However, the Erstligisten in Austria are still about one and a half weeks in the winter break. The last competitive match RB completed on 16 December. The guests are in the match of Bruges vs. Red Bull Salzburg in the odds after all the favorites. 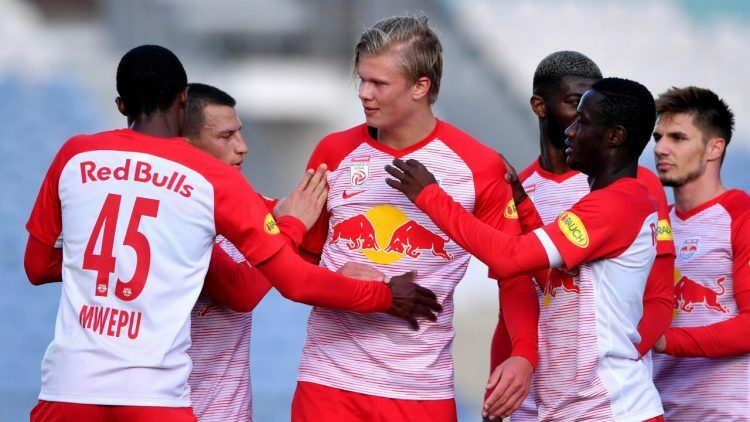 Also, the betting base anticipates in their preliminary report with Salzburg and sets in the Europa League match Bruges vs Red Bull Salzburg their tip on “win Red Bull Salzburg”. The club Brugge secured in the preseason the 15th championship in Belgium. It was also the second title in the past three years. Thus, the blue-blacks participated for the sixth time in the Champions League. There Bruges could secure with a win and three draws but only the third place in the group. This is the fourth time that the reigning champion from Belgium has played the knockout phase of the Europa League. So far, the club failed twice in the round of the last 32 and once came to the quarter-finals, in the season 2014/15. The home record of Bruges in the European Cup leaves much to be desired. For nine international home matches Brugge is waiting for a victory. There were four draws and five defeats. In the last three European Cup games, the Belgians remained without a clean sheet. In the domestic league, the team of coach Ivan Leko has to remove the title defense. After 25 match days, the blue-blacks are already eleven points behind the KRC Genk. So far, the reigning champion’s season record is 13 wins, seven draws and five defeats. Club Bruges have a great advantage on Thursday: the team resumed their competitive matches on January 20th. Of the first four league games of the new year, the Leko team could win only one. There was also a defeat and two draws. On Sunday, it was only enough for 2: 2 at the city rivals Cercle Bruges. The coach usually lets his team play in 3-5-2. Since the “Footballgate” affair, Club Bruges has also had to cope with numerous other sources of fire. In autumn 2018, a major raid had shaken football in Belgium. At that time, the authorities had made 29 arrests in connection with allegations of bribery, money laundering and match-fixing. Bruges coach Ivan Leko was also detained by the police for one night. Leko’s innocence was quickly proven, but since then, the club is in a small low. The mood is tense. In addition, the relationship of the coach to his captain Ruud Vormer is shattered. Now the question arises, who wins this power struggle. The coach’s contract expires at the end of the season. Against Salzburg, the club has to renounce Arnaut Danjuma. Center-back Matej Mitrovic and center-forward Jelle Vossen are also injured. Overall, the bookmaker Bruges against Red Bull Salzburg with their prediction for a tip on the win at a disadvantage. Red Bull Salzburg secured the fifth championship in a row in Austria in the 2017/18 season. Again, the bull missed but the move into the Champions League group phase and had instead ran back into the Europa League. Salzburg have won all six group games for the third time since 2009/10 and 2013/14. For the fifth time RB remained without a defeat in a group stage and was able to win a group for the fifth time. Last year, the men of coach Marco Rose in the Europa League to the semi-finals and failed there just narrowly to Olympique Marseille. Until the defeat in the first leg of the quarter-finals at Lazio Rome RB Salzburg had 19 European Cup games without defeat in a row. They had taken away five wins and five draws abroad. Salzburg are still unbeaten this season. The last defeat for Red Bull came in the last league game of the preseason. On May 27, the Rose-Elf lost 0: 4 at Austria Vienna. Since then, the Bulls have been without defeat again for 31 competitive matches. In the first 18 Bundesliga games, there were 15 wins and three draws. With a goal difference of 46:16 Salzburg has both the best offensive and the best defensive of the domestic league. The overall balance under coach Marco stands at 67 wins, 20 draws and only six defeats. Now, after two months without a competitive match, the Austrian champion has to return to full speed. During the winter break, the club completed a training camp in Portugal and played six test matches. Salzburg had five wins and one draw in the preliminary matches. Coach Rose wants to set even more focus on speed with his team from the spring. Takumi Minamino came after his participation in the Asian Cup only now to the team. Freddy Gulbrandsen should not be fit for the first leg in Belgium yet. Even Jasper van der Werff is still missing injured. In addition, Amadou Haidara and Reinhold Yabo were handed over during the winter break. New to the squad are Antoine Bernede, Erling Braut Haaland, Albert Vallci and Youba Diarra. Diarra is the only player who currently can not be used because of an injury. Both clubs meet for the first time on Thursday. Brugge played nine times against teams from Austria. There were only three wins for the Belgians so far. The last time they met in the 2005/06 season in the Champions League group stage on Rapid Vienna and could win both duels. Salzburg has been dueling ten times with Belgian clubs so far. RB won five games. The Austrians have always played against the last six games against Standard Liege. Brugge wants to lay the basis for progress in the first leg at home. For four European games, the blue-blacks are unbeaten. However, there has been no victory for nine international home games. The Europa League now seems to be Salzburg’s new favorite competition. Already in the preseason the Mozartstädter played an impressive European Cup season. Also this year, RB has a great run both nationally and internationally. The biggest and only problem for the guests could be the fact that Red Bull has not played a competitive match for two months. During the test matches, Coach Rose played a 4-3-3 or a 3-1-4-2 in addition to the familiar 4-4-2. Unlike the national team, the Belgian champion does not belong to the European football league. Thus, Bruges is after the CL group stage in the Europa League again. And even against the champion from Austria, the blue-black are not the favorites. Added to this are atmospheric disruptions and rumors surrounding the end of Coach Leko’s time. On the other hand, sunny sunshine prevails in Salzburg. The title at home is already as good as under the roof. Thus, Red Bull can focus on the Europa League as in the preseason. Despite their long competitive break, we trust the guests to win in Bruges and win at the game Bruges vs Red Bull Salzburg our tip thus on “victory Red Bull Salzburg”. If you do not want to bet on the outcome of the game, you could play in the match between Bruges vs Red Bull Salzburg also try to predict “both teams to score“. Salzburg have scored ten goals in three group matches outside Austria. RB striker Munas Dabbur leads the European League scorers list with six goals. Brugge have scored only three goals in the past 16 home games, once against BVB and once against Atletico Madrid.